Correct Piping System is essential for proper working of a centrifugal pump. The Pump, which raises Water or a Liquid, from Lower Level to Higher Level by the Action of Centrifugal Force, is known as Centrifugal Pump. The information on “How Reciprocating Pump Works?” is already covered in below post, where you can get all the details. Read: How Reciprocating Pump Works? Hence in this post, I am going to cover the piping system which is very important from an engineering point of view for a centrifugal pump. A pump is a machine which converts Mechanical Energy into Pressure Energy. The Action of Centrifugal Pump is that of a Reversed Reaction Turbine. In Centrifugal Pump, the Water enters the Impeller Radically and leaves the Vanes Axially. The successful working of Centrifugal Pump depends upon the correct selection and layout of its Piping System. Hence, an extreme care should always be taken in selecting the size of the pipe and piping system. The Suction Pipe of Centrifugal Pump plays an important role in the successful and smooth working of the Pump. A poorly designed Suction Pipe causes insufficient Net Positive Suction Head (NPSH) and also Vibration, Noise, Water Hammer, Excessive Wear etc. While laying the pipe, a great care should be taken to make it airtight. 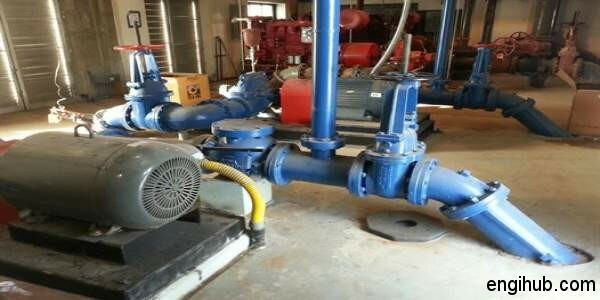 To avoid the entry of Foreign Matter in the piping system, a Strainer Foot Valve is connected at the bottom of the Suction Pipe. Since the Pressure at the Inlet of the Pump is Suction, which is also known as negative and its value is limited to avoid Cavitations, it is, therefore, essential that the losses in the Suction Pipe should be as small as possible. For this purpose, bends in the Suction pipe are avoided and its diameter is often kept larger. Double Suction Pump is those in which, the Suction Pipe is branched into two parts and the liquid is allowed to enter the Impeller from both sides. Hence the Axial Thrust in Double Suction Pump is considerably low. In order to protect the Pump from Water Hammer and to regulate the discharge from the Pump, a Check Valve is provided in the Delivery Pipe, near the Pump. The size and length of the Delivery Pipe depend upon the requirement. I hope above information will give you a better idea of the piping system in pumps. Power Plant: Why to use Surge Tank in Hydro Electric Power Plant?